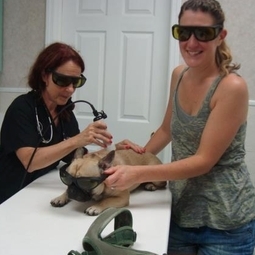 At Northside Veterinary Clinic, we strive to offer the latest technology in health care for your pet. This FDA-approved, deep-penetrating light allows relief of pain through the release of endorphins and stimulates the injured cells to heal at a faster rate. When choosing a treatment option for your pet there is now an alternative to pharmaceuticals. The Companion Therapy Laser System can provide immediate results without any harmful side-effects. This is a huge benefit in treating chronic conditions such as arthritis, hip dysplasia, back disease or injury, and degenerative joint diseases. treatment sessions to fully benefit. Call us today to see if this exciting new technology is right for your best friend.